WhistlePig was born in 2008. After spending his last dime on 500-plus magical acres in Shoreham, Vermont, Raj joined forces with Master Distiller Dave Pickerell (of Maker's Mark fame) to plot the long awaited return of rye whiskey to the States. The two men got their hands on the best batch of aged rye in North America. A few months later, in February '09, they hatched a 5-year plan to transform WhistlePig Farm into the first ever single malt, one-stop rye shop, with all stages of the process located on site: from growing the grass, to distillation, to barrelling and ageing, to bottling. With the opening of our single-estate farm distillery in the summer of 2015, what was once a pig-headed dream will be a top-shelf reality. 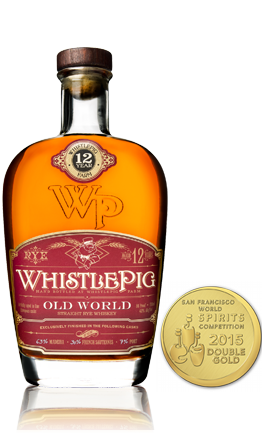 WhistlePig is proud to be the most awarded Rye Whiskey maker in the world. On January 1, 2010, Raj & family cleared out an old barn, rolled up their flannel sleeves, and started bottling the exquisite rye. The Pig was out of the pen! A 100-proof, straight rye whiskey, aged for at least ten years through a unique double-barrel process. 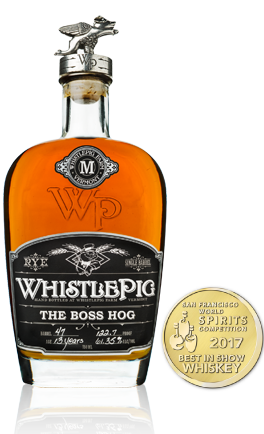 WhistlePig embodies the perfect combination of proof, purity, and age - hitting 'the sweet spot' in all three categories. In short: more rye, all the proof, and the perfect age. 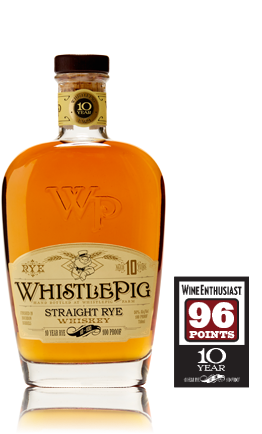 WhistlePig was released in the summer of 2010 to great critical acclaim, earning 96 points from Wine Enthusiast, their highest rating ever for a rye whiskey. The debut of the world's first "Triple Terroir" whiskey made from Our Grain, Our Water, Our Wood. Limited Release: Crop 1 of FarmStock will only be available in 2017. FarmStock is a historic step in realising our vision of creating true farm-to-bottle whiskey. It is the manifestation of the dream that launched the company: to produce the finest whiskey in the world from our Vermont farm. Crop 1 marries the untamed contours and boldness of our estate whiskey, which only youth can provide, with the richness of our best five to six year ryes, topped off with the splendour of our 12 Year whiskey. Master Distiller Dave Pickerell began a unique experiment after studying the best techniques of the Old World - particularly Scotch Whiskies - pairing bonds of 12 year old rye with premium European oak casks - Madeira, Sauternes and Port. After a series of single finish releases in very limited quantities, the 12 Year Old World is the product of a carefully selected marriage of the three. 30% Sauternes, 63% Madeira, 7% Port. 2015 Double Gold Award, Best Rye, San Francisco World Spirits Competition. This IVth. edition of The Boss Hog, The Black Prince, is a tribute to the great spirits of Europe. This is the first Rye Whiskey ever finished in Armagnac casks, straight from France. The result is extraordinary. A fine balance between American power and French sophistication. There's nothing else like it. 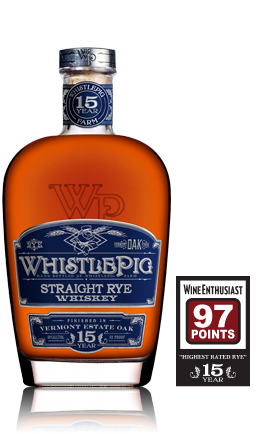 The newest release from the WhistlePig Farm; 15 year old, 100% rye, finished in Vermont Oak casks made from trees on the farm. The harsh winters and short growing seasons of the Green Mountains bestow a tighter grain pattern upon these trees, imparting nuanced flavours into the whiskey. After being milled, seasoned, and raised by some of the best coopers in America, the new barrel receives a long toast and heavy char designed to draw out a rich sweetness that complements the natural spice of aged rye. The final product mingles rye spice with wood sugar, earthy oakiness and lush citrus notes, all wrapped in a velvet smoothness unique to the finest aged spirits.